Abstract: The Crucial Radeon 9700 Pro uses the same ATI R300 core which has 107 million transistors built on the 0.15 micron manufacturing process. When Crucial began offering ATI Radeon 8500LE videocards, it was evident that it would be only a matter of time before they would also adopt the Radeon 9700 Pro as their own. 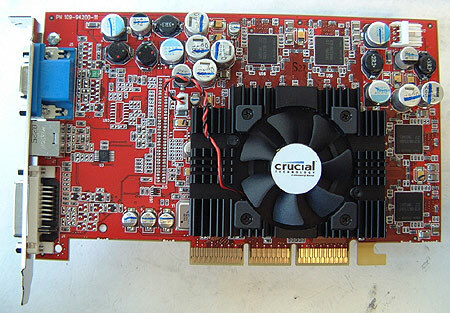 If you remember, Crucial's first video card offering the 128MB Radeon 8500LE was met with a bit of controversy, as hard-core gamers honestly expected something that would satisfy their speed cravings right off the bat. We're not going to dwell on that anymore, and today we're going to focus on Crucial's new top-end videocard, the Crucial Radeon 9700 Pro which uses 2.8 ns Samsung BGA DRAM - can anyone say "Fast!" Unlike the Radeon 8500LE which was a good choice for value oriented users, Crucial is targeting high-end gamers with their Radeon 9700 Pro, which retails for about $369USD. To top things off, anyone who has bought memory from Crucial knows they have an excellent level of service and support! The Crucial Radeon 9700 Pro has all the goodies that come with the standard Radeon 9700 Pro. It uses the same ATI R300 core which has 107 million transistors built on the 0.15 micron manufacturing process. The card is fully DirectX 9.0 compatible, as well as being an 8X AGP part. The 128MB of memory on board uses a 256-bit memory interface which gives an amazing peak bandwidth of over 20GB/s! Looking at the bright red card itself we see that the Crucial Radeon 9700 Pro is identical to the ATi Radeon 9700 Pro except for the stickers. 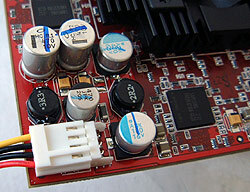 As with all Radeon 9700's, the Crucial Radeon 9700 Pro has an auxiliary power connector at the left hand corner. If you don't have a spare floppy header in your system there is not reason to worry, Crucial includes a Y splitter cable in the package. Also included, is a DVI to analog converter, S-Video cable and a S-Video to composite converter. Likewise on the back of the Crucial Radeon 9700 Pro we have the EMI shield over a few resistors on the back of the power plant for the videocard. Because the Radeon 9700 needs so much power, there can be quite a bit of EMI interference. With a 107 million transistor count and being built on 0.15 micron technology, you're sure to have quite a "toasty" videocard in your AGP slot! It's nice to see that ATi and their manufacturing partners are taking GPU cooling much more seriously now. Crucial is using the reference Radeon 9700 cooler with their videocard. Not the flashiest GPU cooler on the market but it does the job and it's quite a bit quieter then the GeForce4 reference coolers. Between the GPU and heatsink was a yellow sticky TIM, the same one we found on the ATi Radeon 9700 Pro. Again not the best, but much better then a thermal pad or thermal glue.